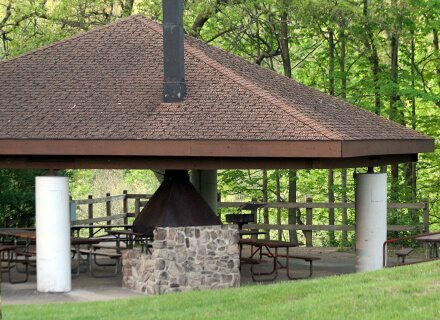 Cottonwood shelter is a perfect choice for visitors looking for a setting to play outdoor sports while enjoying the scenic beauty of the park. A wooded patio next to the shelter provides spectacular views of the wetlands and forest. Just across the road, the athletic field offers a playground, archery range and plenty of room for ball sports. A volleyball court and horseshoe pit are a short walk away. From the Gatehouse, take the first left and continue for a quarter mile. The shelter is located adjacent to the athletic field on the right.